You should have at least one watercolor journal. I’m not going to get into which watercolor journal is better. To me, it’s an exercise in absurdity. I’ve rarely seen anyone sell their journals. Rather, most of us use them either for traveling or experimentation. Travelers may want something like a decent pouch or other features. To be honest, I’m the wrong person to ask here. When I travel, I get heavily into drawing, not watercolor. When I first started watercolors, I heard from an old man that he wishes he spent more time drawing. In fact, he said that he should have spent his first year drawing two hours for every hour painting. That stuck with me. Painting has always been easier than drawing. So I focus on drawing. The painting for me is easy. You’re going to make a lot of mistakes. That’s a good thing. Show me someone who is perfect and I’ll show you someone afraid of taking risks. If you’re going to get better at anything, you have to take risks. That goes from everything from life to sports to art. A watercolor journal gives you the cheap opportunity to take risks and not cry about ruining something you spent a lot of money on. Strathmore makes pretty cheap journals. I think I bought mine on sale at the art store for under $5. Moleskin makes ones that are a little bit more expensive. But still, wrong mindset to even think that way. You’re saving money by making your mistakes in a watercolor journal rather than the real deal. That’s what I’m getting at. Do your experiments there. Make your mistakes there. For instance, I talked about testing inks in a journal. Also, I do my initial mixing in a journal first. 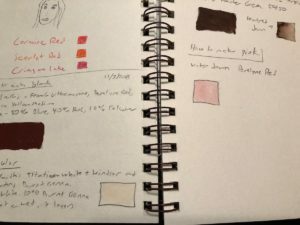 I learned how to make black, brown, and pink in a journal. Black is a mix of blue and red with a little yellow. Brown is red and green, about 50/50. I make my pink by watering down red. Whereas a watercolor journal may not necessarily have high end watercolor paper, it’s still watercolor paper. Since I’m using the thing for experiments anyways, I’m not doing the seven layers of wet on wet I do for skin tones. It’s always simple stuff. I even test colored pencils with watercolors in the journal. One of these days, I’ll incorporate colored pencils more. I rarely use them, despite having some pretty decent ones. The funny thing though – my journal literally had more words than paint. I’m always writing detailed notes for everything I try in that thing. Makes a great reference for the future. One more thing. You know how watercolors are transparent and gouache is opaque? Well, some colors are more transparent than others. Some mixes will become somewhat opaque. You can learn this cheaply in a notebook rather than learning it the hard way on a real painting. Definitely get one. It will save you money, and also may prevent a bit of heartbreak. So much better to ruin a page from a journal rather than the real deal. Please note that as an Amazon Associate I earn from qualifying purchases. This is as absolutely no cost to you, and helps keep my bills paid. I will never recommend a product that I do not use myself. In this specific case, this may not necessarily be the best watercolor journal out there, but it’s great for experimentation which is what I use it for as it’s “good enough” and it’s super cheap. Nothing. Those terms are used interchangeably. They’re both watercolor books that artists use for either outdoor painting or experimentation. Or both. Some people like the term journaling. Some people like the term note-taking. They mean the same thing in this context. Previous post: How does an artist create his or her own distinctive art style?